The recent allocutions of His Holiness John Paul II about Hell and Purgatory have reopened the discussion about the existence of these places. After Vatican Council II and the innovations it generated, many progressivists have questioned these realities. 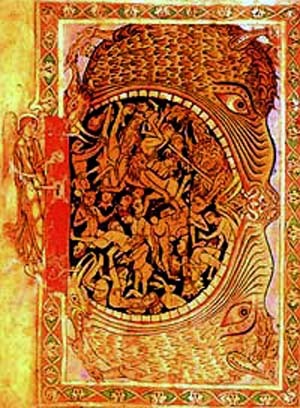 Hell would not be a physical place inhabited by the demons established in the center of the earth where the souls of the reprobates go after their private judgments to remain there forever and ever. It would be a state of spirit of suffering to which man would be subject in this life. A similar stance is taken on Purgatory, which also would not be a place, but a phase of purification here on earth. In face of the evidence of phrases from the Old and New Testament that characterize Hell as a place and the constant Catholic teaching on the matter, some progressivist authors admit its existence. But they affirm that after the Redemption of Our Lord, Hell was emptied. Empty at least of condemned souls, for these theorists “forget” to deal with the devils who are bound in Hell. According to this notion, the devils have been reduced to the great ranks of the “unemployed.” I don’t know how the progressivists would resolve this matter. It seems to me that in order to accommodate the new theory, the devils would have to cease to be individuals and become cosmic forces. But this is not the moment to delve into further detail on this matter. Be it the first thesis - that Hell does not exist - or the second - that Hell exists but is empty - the basic progressivist premise is the same. It is customary to appeal to a sophism relying on Divine Goodness, which I will summarize: “God would not be infinitely good if He would desire eternal suffering for innumerable souls. Therefore the suffering of Hell does not exist, or, if it did exist, it would have been emptied with the Redemption.” A similar rationale is employed with the aim of eliminating Purgatory. To respond to this sophism, I could argue the need for the justice of God to balance His goodness and show that the two characteristics that exist substantially in God cannot be contradictory. The conclusion is that Hell, being a demand of justice, is in harmony with Divine Goodness. However, in today’s article, I want to situate myself only in the ambit of the Divine Goodness and on this field make my discussion with the progressivists. Suppose that God would eliminate Hell. What would be the consequence upon men who live on this earth? Let me distinguish between the bad and the good men. Since an eternal chastisement would no longer exist, evil men would feel every liberty to execute all the crimes that they would like to commit in their personal lives as well as in society. That is to say, the evil would tend to harm themselves by giving free reign to their passions and to hurt others as well in order to benefit themselves and their own interests. Even among evil men themselves, life on this earth would become much worse and more unhappy. For the good men, the end of the existence of Hell would be a strong discouragement to practice good, since “fear of God is the beginning of wisdom.” Following a psychological dynamism similar to that of the evil, the good would tend to care less about combating their bad tendencies in their private lives. Further, they would have to allow the evil they see around them go unpunished. For if God Himself ceased to punish, then to imitate Him would demand giving liberty to the evil in the life in society. Now, if the evil were not punished, then the fight would disappear, and with it, the courage to confront adversaries, the nobility of spirit that underlies dedication to great combats, the honor that comes from the concept of not making concessions to the enemy, the sense of sacrificing for one’s brother in the fight, and the healthy competition in the progress of Catholic militancy. That is to say, the good would lose that which dignified it and make it respectable: their capacity to instill fear in the enemy. It would come to be a good without fiber, a good without the capacity to attract. If God would abolish Hell, the life of the good men would become extraordinarily worse. Therefore, the immediate practical consequence of the abolition of Hell as an actual place for the punishment of souls after their earthly existence would be to transform life on this earth into a hell for the good as well as for the evil. It would not be in reality an abolition of Hell, but a transference of place and an extension: in place of being situated in the center of the earth, Hell would come to exist on its surface; in place of punishing only the evil, it would afflict indiscriminately the good and the evil. To avoid all this suffering for the good and the evil on this earth, God created and maintains Hell as a place destined for the condemned. More than an act of justice in relation to the evil who die, it is a demand of the Divine Goodness with regard to the good and evil persons who are living.